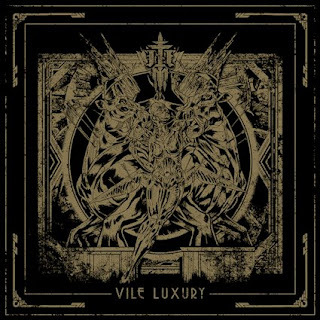 New York's Imperial Triumphant have returned with a new recording which continues the experimental and progressive style of black metal from previous releases and this is a review of their 2018 album "Vile Luxury" which was released by Gilead Media. Avant garde jazz sounds start off the album before going into more of a faster and technical direction which also introduces blast beats onto the recording while the vocals bring in a mixture of death metal growls and black metal screams along with a great portion of the tracks being very long and epic in length. All of the musical instruments on the recording have a very powerful sound to them while the songs also bring in a great mixture of slow, mid paced and fast parts along with the music getting very experimental and progressive at times as well as some dissonant structures and one track also brings in a brief use of choir vocals. When tremolo picking is utilized it gives the music more of a raw feeling while the songs also mix the avant garde elements into the heavier sections of the songs along with some tracks also bringing clean guitars onto the recording and as the album progresses elements of noise are added into the music and they also bring in an instrumental and there is also a brief use of operatic female vocals. On this recording Imperial Triumphant expand on their avant garde and experimental style of black metal by taking it into new directions and also bringing in elements of death metal, the production sounds very professional while the lyrics cover futurism, philosophy and decay themes. In my opinion this is another great sounding recording from Imperial Triumphant and if you are a fan of avant garde black metal, you should check out this album. RECOMMENDED TRACKS INCLUDE "Swarming Opulance" "Chernobyl Blues" and "The Filth". 8 out of 10.